Full illustrated desciptions of knitting principles. Note: This page is a prototype. Almost pages are written in Japanese. (The symbol indicates the English page.) This page will show only an overview of this site. The elements of this website, including text, graphics, and photographs, are protected by international copyright laws. This section is for beginners who don't make sense from the knitting books "for beginner". How can I begin knitting? Where may I buy knitting tools? How to hold the needles? How to make a stitch? We describe them with many illustrations. Knowlege and techniques to knit the first scarf. Full illustrated descriptions on the first cap. Full illustrated descriptions on the first socks. Full illustrated descriptions on the first glove and mitten. Full illustrated descriptions on the first sweater. This section shows only one basic technique - 'Knit' with many illustrations. This section shows only one basic technique - 'Purl' with many illustrations. This section shows the way of circular knitting with 4(or more) double pointed needles. We had a study upon the old method from old pictures. Basic Stitches with full illustrated description. Scarves,caps,hats,gloves,socks...and so on. They are the little charming projects for beginners. Let's try one and learn the basic knittng tips! Simple and easy-to-knit scarves with Rib stitch, Waffle stitch, Open work. A minute description of making a hole on scarf. Simple and easy-to-knit caps and hats. A watch cap with rib stitch. A hat with stocking stitich. A Big beret. Instruction on the warm woolen under short pants. The sweaters basically Knitting & Purling. We produce some toy knits and garments from English knitting patterns. The toy knits are designed by Debbie Bliss, an English knit designer, and they appeal to everyone. There are different types made from our popular toy crochets. Just take a look at little pigs and teddy bears. Our Knitting-related arts,Japanese traditional short style poem '5-7-5' and so on. '5-7-5' is a traditional style poem in Japan. We made some poems on knitting. We close up knitting techniques, Tips, Topics, Events, Studys... and so on. Hand-knitted wedding dresses craze Japanese ambitious knitters. Do you feel awkward circular knitting with DPNs? Do you pinch a short circular needle with your thumb and forfinger when you knit a sock? Try this trick with 2 circular needles. A trial report on 'Super-pompom-maker' & 'Hanaami-loom'. We tried Clover's new knitting gizumos 'Super-pompom-maker' and 'Hanaami-loom'. We are interested in traditional knitting. We have tried to recreate some historical garments that are on display in museums. We make our products based on historical principles. Sanquhar is a city in southern Scotland. The Sanquhar glove was the most typical knitting product of the area. Only a few knitters of this product exist today. We created a Sanquhar glove from a picture in Dumfries and Galloway Museum. We examined a pair of Sanquhar gloves which Chihiro Sato, a knitwear designer, owns. We made the complete pattern of the glove. Would you like to try knitting it? 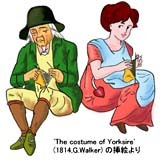 The Graphic based Japanese knitting patterns are not familiar except Japanese. Some knitters who have worked with text patterns could be confused with it. If you find a lovely knitware which described with Japanese knitting pattern, this capter is for you. The basical information on Japanese Characters, mesurements, needles, etc. Japanese knitting instructions are depicted with graphical symbols and charts. 'Knitting Pattern' is the biggest obstacle for Japanese. Usual English-Japanese translator tend to translate knitting pattern to Japanese text which we don't make sense. We try to make a descripton of it. And we developed a new translation software named 'Knitran'. English knitting patterns are full of abbreviations.They are far from plain English. We made a guide of the pattern. Online English-Japanese translator 'Knitran' translates English patterns in Japanese immedately. The computer helps your knitting on calculating, color maching, drawing graph papers and printing knitting charts. You can get the actual-size-graph-paper PDF file on demand. We're developing on-line softwares for color matching, size variable knitting pattern.